As I mentioned previously, during my last visit to New York a couple of weeks ago I had the chance to do a bit of (window) shopping at some stores we don't have in the UK. One of these stops was at Club Monaco. I didn't used to think much of their clothes but after visiting their stores I couldn't have been more wrong. They have a great selection of classic and contemporary classics. Some of their key seasonal pieces have a real luxe feel to them, which makes them a bit higher priced than your average Zara item but also seems to be worth it. 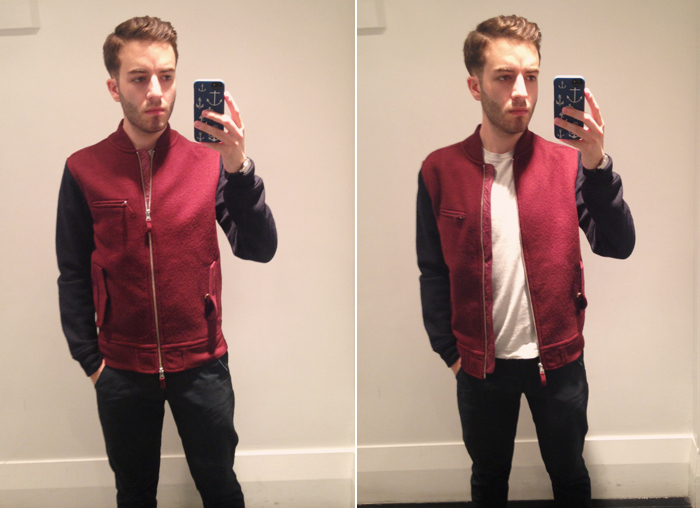 One of such items was this Boiled Wool Bomber Jacket in burgundy and navy, which I tried at the store. It was incredibly lightweight, made with a very slim material, but really warm. The quilted detailing inside give it a sort of sportswear feel when it's on and it's one of those versatile pieces that can look very sporty worn with a t-shirt and jeans but also elevated when paired with a button-shirt, chinos and smart shoes. I, of course, was dumb enough not to buy it thinking there might be a way of buying it later from the UK – which, guess what, there isn't. And so, this makes my first FW13 Wishlist item this season.